TI (s ti) launched a new version of its BeagleBone development board Tuesday that cuts the price in half and offers a lot more functionality. It also launched a $50 sensor board bundle packed with on-board motion and environmental sensors as well as GPS. The moves are aggressive, and they put TI’s new BeagleBone Black in direct competition with Arduino boards and the Raspberry Pi developer computers. 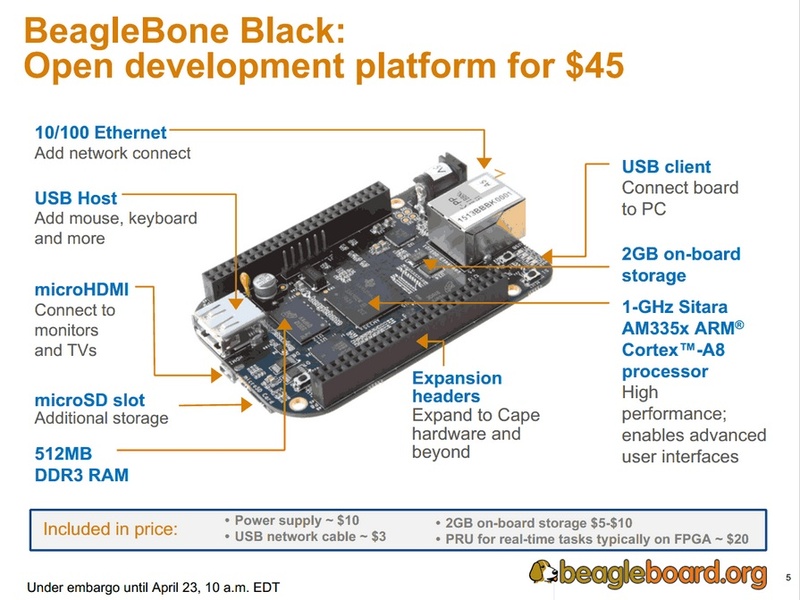 The details on the new BeagleBone board are here, but basically TI is offering a 1 GHz ARM processor plus the connectivity and power components on a single board for $45. That’s a lot of compute power for a little price. While the Raspberry Pi costs $35 it doesn’t have as many ports built in, and Adrian Valenzuel, marketing director of TI’s Sitara ARM processor product line, said it also isn’t as open. When pressed, he said that people who build with the Pi can’t buy the hardware that comprises the Pi board on the open market, unlike with the TI board. He’s right. The chip on the Pi is built by Broadcom (s brcm), but it’s not something that anyone can simply order and play with. On the flip side, Atmel, the company that makes the processors on the Arduino boards, sells those components and has released software supporting the Arduino community. And while some people might be content to play with $35 Pis, there are plenty of people thinking about pro-quality projects that might want to get even more granular than the board, and try their hand at tweaking the components around the processor. That’s TI’s sales pitch as it moves down market to the class of makers who love the power of the Pi over the ubiquitous (in Maker circles, anyway) Arduino. TI’s hope is that by getting people playing with its board it can sell components and attract a user base that wants to play with its hardware. It may never be a huge business, but it’s one that chip makers are paying attention to. Earlier this year AMD introduced its GizmoSphere board, a $200 board and developer community for makers. While none of the companies involved are willing to share any sense of how these products may help them financially, it’s clear that chip firms are eying the maker community as a market worth paying attention to, especially as the internet of things heats up.